I am a huge Star Wars fan. I was 6yrs old when the first Star Wars movie hit the theatres. Although I was young, that movie changed my life. One of my favorite characters is R2-D2. 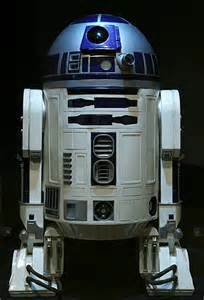 I alwaya wanted a real R2 unit, and I would spends hours upon hours playing with my action figures and running through the woods pretending I was Luke Skywalker. As I got older and had kids of my own, they too became fans of the Star Wars trilogies. 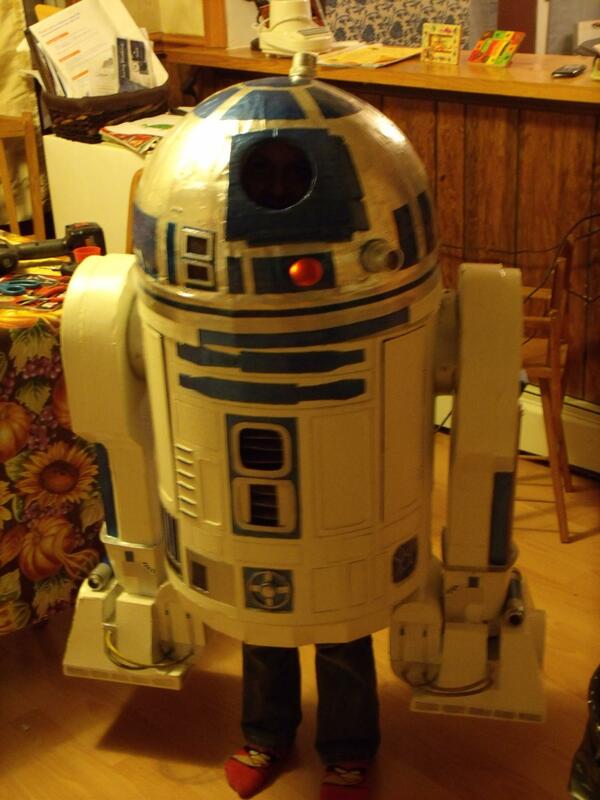 So I was excited that my oldest son, Spencer, told me that he wanted to be R2-D2 for Halloween. A first I wasn't quite sure how to make that happen. I looked on line and there were no costumes of this iconic character to be found. And then one day while I was at work at the Beverage Plant, and I noticed an empty cardboard barrel that was getting thrown out. It was the perfect size and shape to make the torso for R2. Then as I looked around I noticed of items that I could use. 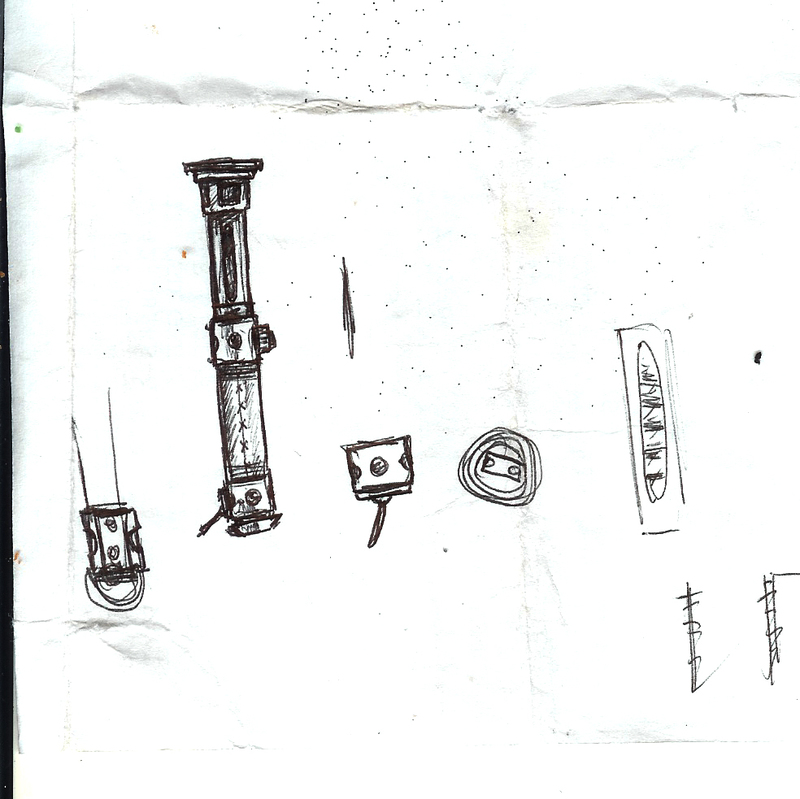 After some serious brainstorming , and sketching I came up with the plan for my son's costume. Staying with George Lucas's idea of Star Wars being a used universe, this R2 costume would be made from recycled materials. I would say 95% of this costume is recycled material. From the dome being newspaper and bottle caps, to the wiring on his legs. All recycled. Honestly, I do not think I spent more than $30. making it. Paint, glue, and a few pieces of hardware were the only items purchased. The only thing I spent on it was the time creating it. The costume has won various contests, and has been used locally for Star Wars Fundraiser functions. In a way, I finally did get my droid. Well my son did. But that's fine with me. 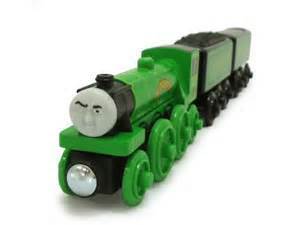 My middle son, Brennan, loves trains, and for years loved the Thomas and Friends series. One year he asked if I could make him a Flying Scotsman costume. Once again I looked on line and could not find a costume. 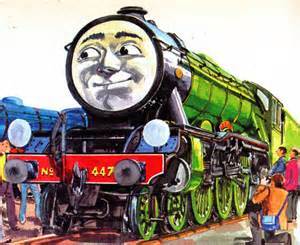 Although I was not surprised because The Flying Scotsman wasn't a real popular engine at the time. I believe he has since made a comeback in the newer movies. Like the R2 Costume, The Flying Scotsman is made from recycled materials. Again, the only items purchased to create this costume was paint and glue. Everything else is cardboard, newspaper, or items that were either going to be recycled or thrown out at the Beverage plant. Although I do not miss working in a Factory, I do miss the access I had to some of the cool items that would get thrown out there daily. My kids love the game Minecraft. they can play it for hours on end. 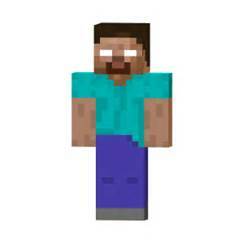 So last Halloween my son Brennan asked me if I could make him a Herobrine costume. Once again, I agreed. However, unlike the previous costumes that I have made, this one I had to purchase the supplies to create it. This costume is made from upholstery foam, felt, and foam poster board. I rigged lights in the eyes to give it Herobrines spooky glare at night. Brennan actually painted the head. He did a great job on it, and it was a big hit on Halloween. For many years my brother Paul and I would volunteer to participate in the Howe Caverns Haunted Cavern. We would set up our music gear down in the cavern, and play for hours while hundreds of families would come through and get scared for a good cause. 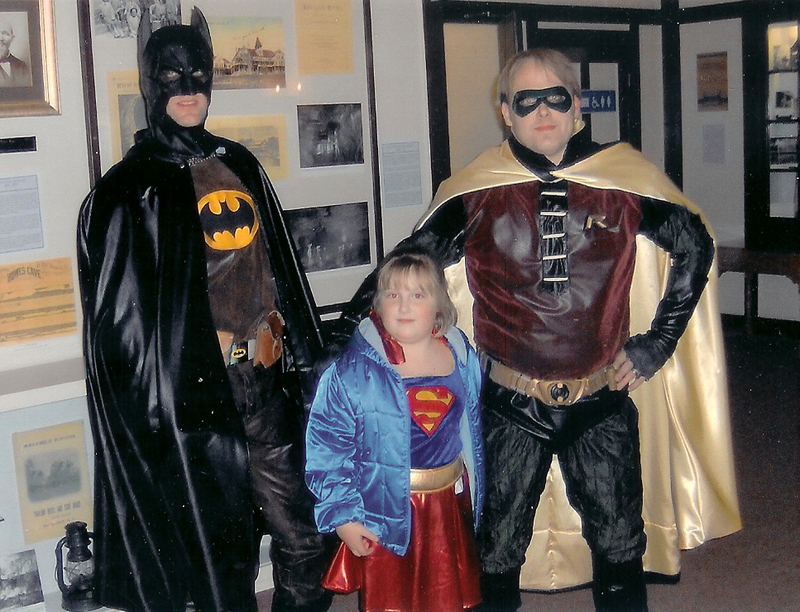 My brother is a huge Batman fan, and every year he would be the Dark Knight. 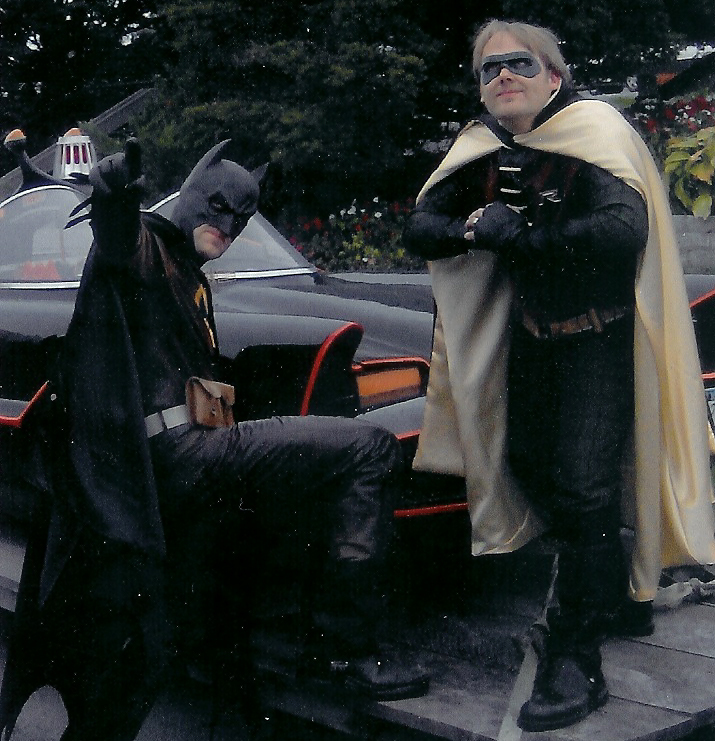 The year that we painted a Replica of the 1966 Batmobile, I decided to dress up as Robin. 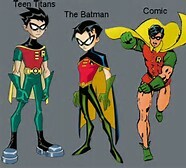 Not one for tights, I decided to create a costume that embodied the various Robin chracters throughout the years. I sewed everything myself, altering a Robin Hood pattern that I had bought. I used a machine washable synthetic leather material. It was very comfortable. The reason for the gloves being fingerless, is that I play guitar and we were playing down in the Caverns. The mask I molded out of rubber. I also made the cape for my brothers Batman costume. I miss playing in the Caverns. It was fun. Not only did I want my own R2 unit, I always wanted a Lightsaber. Though the one that I created doesn't light up yet or have a blade, it is more for decoration. Once again, keeping with Mr. Lucas's idea of a "Used Universe", this handle is made from old , damaged parts from machinery at the Beverage Plant that I worked in. The front of the handle is a Valve from a Bottle Filler, the end is a orange Emergency Stop button. There is also an actual orange plastic bottle within. 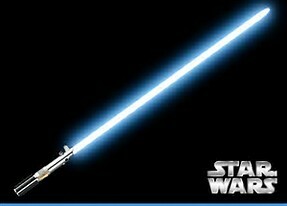 I always wanted an Orange Lightsaber. Orange is one of my favorite colors. Also, staying with my love of leather/ Mtn. Man re-enacting, the handle is covered with dyed leather and stitched with sinu. 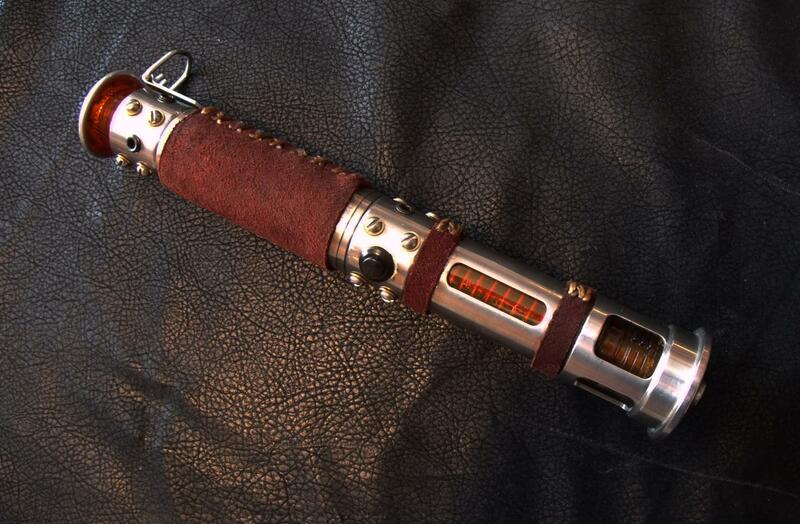 Maybe not your traditional Lightsaber, but it was fun building it. I use to attend Moutain Man Redezvous with my eldest brother Ronnie before he passed away when he was just 36 years old. I learned alot from him. How to start a fire with flint and steel, how to shoot a Muzzleloader, and how to sew leather. I have wonderful memories of hanging at the fireside with him in the evenings, and drinking some Apple Pie. He was such a wonderful person. He always had this old knife blade lying around that he was going to make a handle for. When he passed away suddenly in 2001, I decided that I would finish the handle for him. Using unique pieces of wood found on the property that he owned, I sketched out what I thought would be a design that I thought he would like, and I adapted the handle to the blade. I focused on keeping it simple and primitive. 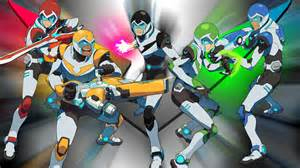 My family are huge Voltron fans, and with the reboot from the 1984 classic that I loved and grew up with, we all decided to be the Paladins of Voltron for Halloween. This was a big under taking for me. Usually I will only make one costume for Halloween. For 2017 I made 4 costumes. Inspired by YouTube videos from Evil Ted, I learned the art of forming foam and had a blast making these. Can't wait for ComiCon. For 2018 I vowed not to make another Halloween costume. 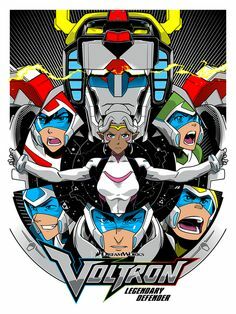 After spending almost 3 months on the Voltron Paladin costumes I told my self "No more." I wanted to enjoy the fall season. This was not the case. 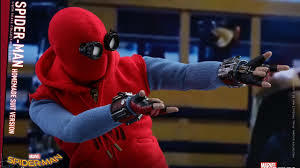 My son wanted to be Spiderman for Halloween, and he wanted it to be the homemade costume that Peter Parker wears in the movie. Well after studying the costume and seeing the cost of one on ebay I decided to make it. It's amazing how an expensive costume can trigger the creative juices. Between Walmart, Dollar Tree, JoAnne Fabrics, and Hpme Depot I creared the costume for under $30. PLus I realized how much I just love to create.